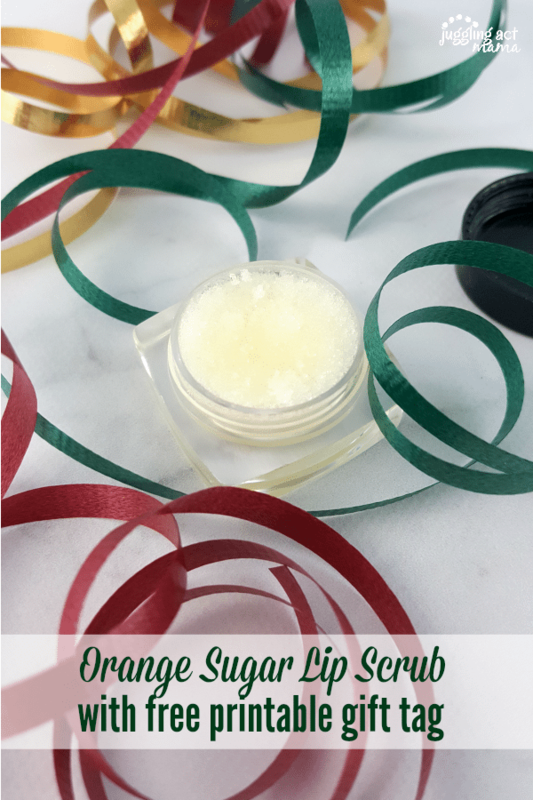 Our DIY Orange Sugar Lip Scrub makes a wonderful stocking stuffer! Looking for a gift for mom? We’ve got a great suggestion – our Orange Sugar Lip Scrub and long-lasting LipSense lipstick! This post has been sponsored by Read My Lipstick NH. This post contains Amazon Affiliate links. All opinions are my own, but I only promote things that I love and think you will love, too! This does not increase the cost to you, but does help support Juggling Act Mama. For more information, please see our Disclosure Policy. This Orange Sugar Lip Scrub is an easy DIY project and we’ve even got a free printable gift tag for you. Pop this in a loved one’s stocking, or make a gift basket with bath salts, lotion, pumice brush, bath bombs, lotion bars, body wash, loofah, sugar cookie body scrub, bath gloves, etc. 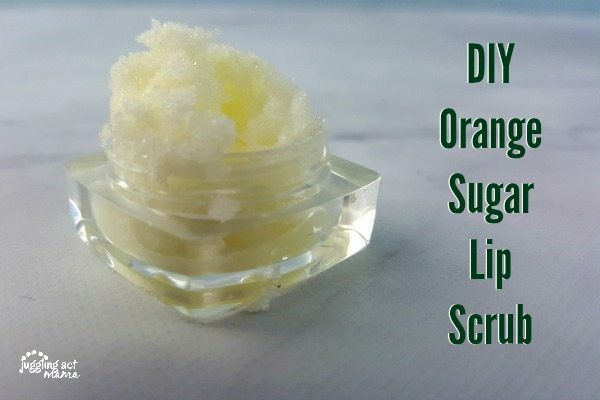 Here’s how to make our Orange Sugar Lip Scrub. This recipe makes about 1/3 cup. Combine the sugar, coconut oil and essential oil until well mixed. Spoon the mixture into your cosmetic jars. Download our free printable gift tag! For the application, rub the scrub onto your lips, just enough to loosen the dead skin. Leave it on your lips for a minute before wiping it off with a damp cloth. Your lips will feel rejuvenated. 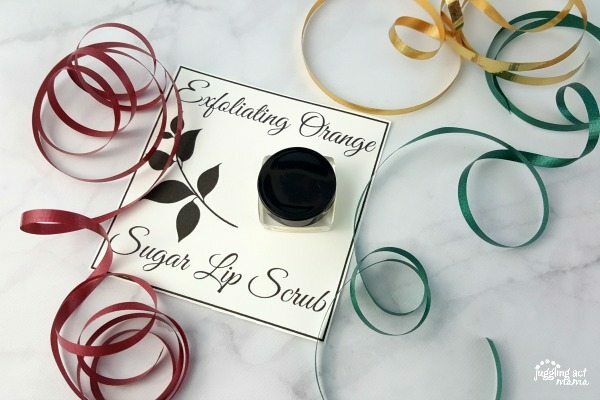 Our Orange Sugar Lip Scrub is the perfect compliment to a gift of lipstick, but this isn’t just any lipstick! If you haven’t heard of SeneGence let me fill you in…. they are a makeup and skin care company that began with it’s unbelievably long lasting lipstick, LipSense. The company has grown to include full make up and skin care lines. Their products are cruelty free and they promote the use of naturally occurring ingredients. No wax, no lead, and they feel amazing. 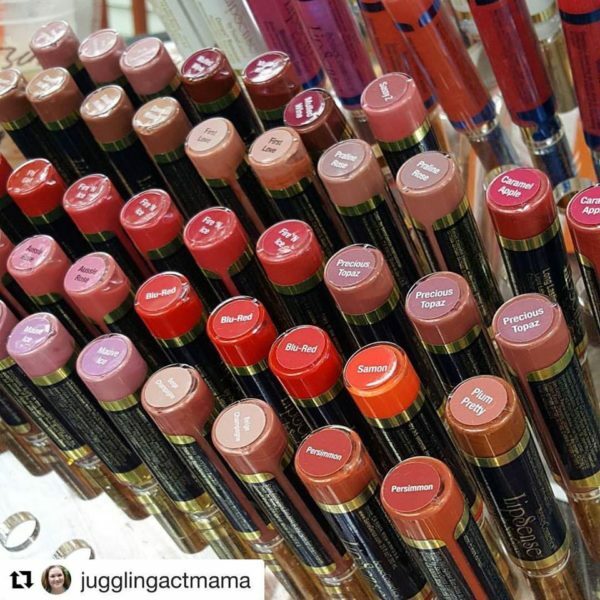 LipSense lasts all day – up to 18 hours. It is water-proof, kiss-proof, smudge-proof, and completely budge-proof. LipSense comes in a variety of captivating colors and can be layered to produce your own custom look by layering and adding different glosses. Check out all these amazing colors my friend Melissa has in stock right now. I’m partial to Sheer Berry myself, and Bella is a close second! What is your favorite color? I’ve also been hinting around to Mr. Juggling Act that I might like to find Plum Pretty in my stocking! My favorite shade? It’s a tie between Pink Champagne and Mauve Ice. I have not tried LipSense yet but I think I would like Bella. Aussie Rose is my favorite. I like the carmel apple the best! The Caramel Apple looks like a shade that might work for me. Thanks! Fire and Ice! So pretty! I think my favorite shade is Persimmon! Pink champagne is the one I want. I love Gingerbread because it’s neutral with shimmer. So many pretty colors it’s hard to choose but I would say Plumeria. Plum pretty is my favorite color. My favorite is fire and ice. Plumeria would be great. Purple tones help make teeth look brighter. I love so many of the colors but the Praline Rose is really gorgeous. I like the ‘plum pretty’ shade. I’ve been wanting to try these! The sheer berry looks lovely! I’m dying to try Sheer Berry or Bella or Dawn Rising. This is a great giveaway! Pink Champagne is beautiful. It is a light flattering pink !! And soft and subtle like me ! I just love your idea about scrubbing your lips. And here between all this lovely lip shades, my favorite is Pink Champagne. I think I’d like the Pink Champagne!